FORT WORTH, Tex.–A new report from the Society of Manufacturing Engineers (SME) highlights what SME called "the exponential growth" in the metal additive manufacturing industry and details the job growth that has resulted. 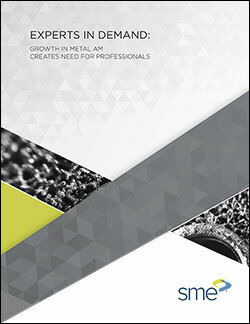 The report, "Experts in Demand: Growth in Metal Additive Manufacturing (AM) Creates Need for Professionals," was released at SME's RAPID + TCT event, which concluded on April 26. It provides a competency model with in-demand job descriptions for metal additive manufacturing positions, along with the knowledge, skills, and abilities for the roles and functions that make up the metal additive manufacturing team. The job descriptions and requirements can be used by potential employers to hasten the recruiting process, SME said in a release announcing the report. The report was built through SME's community of additive manufacturing leaders and thinkers through experience-based insight and data showing. The SME Additive Manufacturing Community was created to promote and accelerate adoption of additive manufacturing within the global manufacturing community. Metal additive manufacturing is not only allowing manufacturers to increase speed to market; it's also helping them produce stronger and lighter parts, improve efficiency, reduce waste, and create new products and geometries not previously possible. To maximize this potential, it is critical for the existing workforce to be trained in additive manufacturing technologies–whether through degree programs, engineering applications, development experience, or experiential additive manufacturing experience in a project-based environment. The competency model helps with the development of job descriptions, as well as curricula and job-training programs, and is part of the process for ensuring consistency for engineers and technologists pursuing careers in metal additive manufacturing. The next step for SME's Additive Manufacturing Community is to use the competency model to build a detailed body of knowledge (BOK). The metals additive manufacturing BOK will be built from, and expand upon, existing work in additive, and will serve as a detailed roadmap for training, curriculum, and, potentially, certification. "Hiring skilled workers is incredibly important to the industry's continued embrace of the technology," said Daniel Braley, USN/USMC flight control surfaces and wings technical integrator, Boeing Global Services, in the release. "Metal additive manufacturing offers cost effectiveness, lead-time reduction, design freedom, and a solution to part-to-part uniformity and repeatability in an automated process." Companies are hiring mechanical and materials engineers with a specialized background in additive manufacturing processes, materials science, and additive manufacturing applications. They are also hiring design engineers that can understand customer needs and leverage the additive manufacturing design and manufacturing space effectively; and manufacturing engineers with a new mindset regarding additive manufacturing deployment and supply-chain logistics. The overall additive industry grew 21 percent in 2017, as the industry expanded by more than 1.25 billion, creating new products and geometrics that could not be done before. It's estimated that 1,768 metal additive manufacturing systems were sold in 2017, compared to with 983 systems in 2016, an increase of nearly 80 percent. The automotive, aerospace, and biomedical industries are the largest users of metal additive manufacturing. To download the report, visit www.sme.org/am3dmetalsjob.